Composition: Cotton, Polyester, and Viscose Blend. Dimensions (HxW): 25x45 inches Finish: Backed with lining and tunnel for easy hanging. Rods and tassels are not included in the quoted price. Care Instructions: Gently vacuum every 6 months. Dry clean only - when required. Note: Colors may vary slightly. History: Old Map of the World Red Italian woven tapestry features a wonderful cartographic rendition of the globe in the 11th century. Full of astonishing details in the world land masses as well as the art in the work surrounding the scientific work, this world map tapestry is simply beautiful. World maps were both an art and a science as cartographers aimed to portray the world in accurate light, based on nautical measurements made by explorers by sea which took months of data to work with to compile the outline of the world. The color palette of blues and browns is simply beautiful in this work, as displayed in the red mille fleur background. 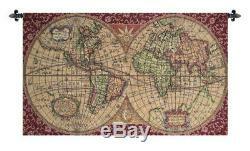 The item "Woven Tapestry Wall Hangings Italian Old Map of the World Red 25x45" is in sale since Thursday, March 1, 2018. This item is in the category "Home & Garden\Home Décor\Tapestries". The seller is "oxemize" and is located in Ferndale, Washington. This item can be shipped to United States, Canada, United Kingdom, Denmark, Romania, Slovakia, Bulgaria, Czech republic, Finland, Hungary, Latvia, Lithuania, Malta, Estonia, Australia, Greece, Portugal, Cyprus, Slovenia, Japan, China, Sweden, South Korea, Indonesia, Taiwan, South africa, Thailand, Belgium, France, Hong Kong, Ireland, Netherlands, Poland, Spain, Italy, Germany, Austria, Israel, Mexico, New Zealand, Philippines, Singapore, Switzerland, Norway, Saudi arabia, Ukraine, United arab emirates, Qatar, Kuwait, Bahrain, Croatia, Malaysia, Brazil, Chile, Colombia, Costa rica, Dominican republic, Panama, Trinidad and tobago, Guatemala, El salvador, Honduras, Jamaica, Antigua and barbuda, Aruba, Belize, Dominica, Grenada, Saint kitts and nevis, Saint lucia, Montserrat, Turks and caicos islands, Barbados, Bangladesh, Bermuda, Brunei darussalam, Bolivia, Ecuador, Egypt, French guiana, Guernsey, Gibraltar, Guadeloupe, Iceland, Jersey, Jordan, Cambodia, Cayman islands, Liechtenstein, Sri lanka, Luxembourg, Monaco, Macao, Martinique, Maldives, Nicaragua, Oman, Peru, Pakistan, Paraguay, Reunion.